Holy Smoke ~ I did it. 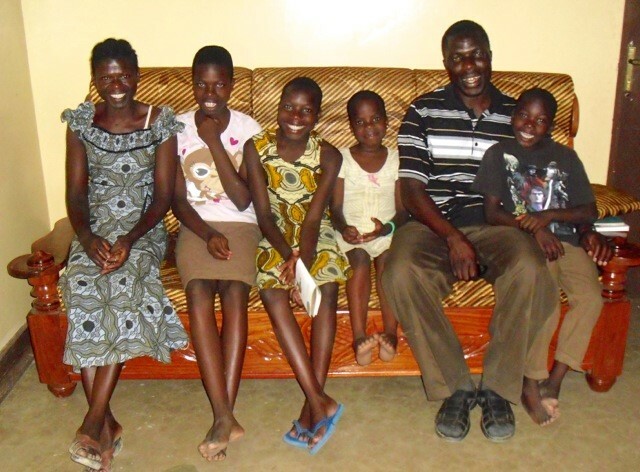 Meet Happiness, Sherry, Veronica, Deborah, George and Meshack Otieno! Happiness is taking the Pastor’s Wives’ English course and she loves it. Thanks to Mary Magdalene’s and all who continue to donate to Karimu. You make these stories possible. Just look at those smiles. A few weeks ago we posted a picture of a handsome young boy by the name of Meshack Otieno who was sponsored by a couple at St. Mary Magdalene’s Episcopal Church. His father, George has a master’s degree from St. John’s University in Dodoma, Tanzania and is teaching at Msalato with no salary, just a place to live. He had his young son with him because he could not bear to be without someone in his family. His wife and other 3 children live in Northern Tanzania. When we sent the money for Meshack’s fees, at Sandy’s suggestion, we sent additional money from Karimu (total of $1,000 I believe). This enabled the rest of the family to come by bus and share the house the college is providing. They came with only their clothes and Sandy said they were threadbare but the joy is that for the first time in 5 years they are together as a family because of George being away at St. John’s University. George attributes everything to the faithfulness and hard work of his wife, Happiness. She was a tailor but has no sewing machine. Sandy thinks there is an old treadle one somewhere at the college and they are looking for it so Happiness can sew and make some money. With the additional money we were able to send, thanks to our donors, they bought a sofa and a chair. They even invited Sandy and Martin to have dinner with them last night. A simple meal she said but shared so lovingly. That reminded me of days of preparing gourmet dinners (way back when ~ not any more) to impress our guests. I was in a gourmet group and we all tried to outdo one another. It became such a burden and gave me no joy. I dropped out figuring that it was more important to get together with friends even over a bowl of soup or stew than kill myself trying fancy recipes. It was filo dough that did me in. I swore to never make Apfel Strudel again. The Africans are way ahead of me. “A simple meal but one shared so lovingly.” Another lesson learned. What I am trying to say is that much has come from little. We know we cannot feed the world but to even give a sip of water is important in God’s world. Mother Teresa said if you cannot feed a hundred people, feed one.